It is almost trite to say that ever since The War of the Worlds, science fiction has evolved under the shadow of colonialism: its vocabulary, its important tropes, and its ways of seeing have all been influenced by the colonial project, and in turn, have contributed to its ideological sustenance. Of course, this has not been without opposition: canonical novels such as Ursula K. Le Guin’s The Dispossessed have questioned—in subtle ways—SF’s uncritical acceptance and reproduction of colonialism’s intellectual architecture. In recent years, however, we have seen a greater willingness on the part of SF writers to engage head on with the question of colonialism, in its manifold aspects—military, economic, and cultural—from a critical standpoint. For these writers, colonialism (and empire) are not simply unarticulated major premises, but the central questions in their novels. China Miéville’s Embassytown (2011), for instance, is a fierce indictment of the destruction of an alien culture upon first contact. The Cuban SF writer Yoss, in A Planet for Rent (2014), constructs a series of haunting and beautiful stories around the relationship between a colonized earth, and the spacefaring species who have subjugated it. 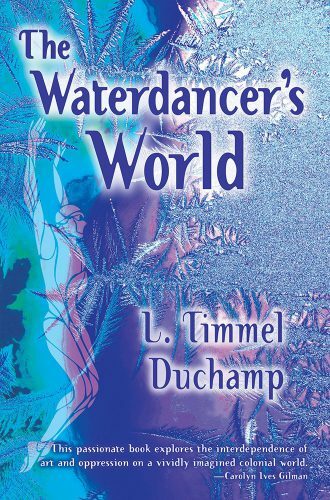 And a recent addition to this evolving tradition (if we may call it that), L. Timmel Duchamp’s The Waterdancer’s World, is a complex, polyvocal novel, which sets itself the ambitious task of exploring the relationship between art, cultural hegemony, public memory, resistance, and economic colonialism, on a galactic scale. The Waterdancer’s World is set on Frogmore, a hostile planet that was first settled five centuries before the events of the novel. A name as prosaic—almost comical—as “Frogmore” destabilizes the classic border-world narrative from the very beginning. As early as page 11, we are told—in an excerpt from “Frogmore’s Destiny: A Manifesto for Independence”—that “the Council named the world Frogmore, in deference to the Frogmore Investment Group, one of the primary sources of venture capital for the first wave of development projects” (p. 11). Evidently, this will be a novel that will—very consciously—eschew the heroic narrative of inter-planetary exploration and colonization for something much grittier—and direct. That expectation is not belied: throughout The Waterdancer’s World, we are reminded that economic interests and trade calculations are the primary drivers of the relationship between the border world and the “Combine Council”, the central Galactic authority. If there existed such a genre as “realist space opera” (with all the paradoxical connotations of that term), we might be able to fit The Waterdancer’s World (somewhat uneasily) within its contours. The plot of The Waterdancer’s World unfolds slowly and gradually, and through multiple narrative voices separated by space, time, and ideology. Consequently, even after finishing the novel, reconstructing its events into a coherent, chronological account is a difficult task; there remain (intentional) gaps. Broadly, however, the story proceeds thus: Frogmore is a harsh and hostile world, with punishing gravity, and an oxygen-thin lower atmosphere permeated by “numerous organisms collectively referred to as 'the Scourge'” (p. 29), who reduce surface visibility to no more than ten or twenty metres on an average. It is settled by a group of pioneering women, seeking to escape from a “thralldom” in which the process of childbirth and child-rearing has been “chopped up into discrete tasks and assigned as such” (p. 66) to women. To deal with the conditions on Frogmore (apart from staying indoors all the time, and building climate-and-gravity-modified “domes”), genetic innovations are carried out—primarily, an exoskeleton that Frogmorian children acquire at birth. From the beginning, the relationship between Frogmore and the “Combine Council” is a tense one, and resembles the relationship of tutelage that characterised European powers’ attitude towards their African and Asian possessions at the turn of the 20th century. The tension is exacerbated by the presence of an off-world “peacekeeping” military on Frogmore, who enjoy an ambivalent relationship with the government and the local elite, but most of all, by the fact that food production is in the hands of inter-planetary corporations, who therefore enjoy tremendous economic leverage. The central conflict in The Waterdancer’s World is triggered by the corporations’ decision to move food production off the planet, a decision that accelerates an ongoing “independence movement” and, in turn, prompts reprisals. The story of this tinderbox is told from the point of view of a number of differently situated narrators. Primary among these is Inez Gauthier, the daughter of the highest off-world military officer stationed on Frogmore, who considers herself a patron of arts and culture, but also holds financial stakes in the food production corporations, and dreams of clearing “the Scourge” from the planet, so that it can be further populated and developed. Then there is Nathalie Stillness, an off-world anthropologist studying “indigenous” life in Frogmore’s domed communities, and suffering from all the anthropologist’s dilemmas involving participation and observation (would acquiring an exoskeleton to “go native” [p. 66] be too much?). There is also Madeleine Tao, a judge and part of the Frogmorian elite, who is called upon to decide the cases of those accused of participation in the Frogmorian independence movement(s), including whether or not to administer to the convicts the Orwellian “Total Rehabilitative Therapy” (colloquially referred to as a “brainwipe” [p. 328]). And there is Clare Gaspel, a member of one of Frogmore’s domed communities, whose way of life is threatened with extinction with the corporations’ decision to pull out of Frogmore’s surface. Similarly, when Madeleine Tao says that “law is always better than the violence and selfishness of chaos … law could be repressive, yes: but think of all the evil that the elimination of law would unleash” (p. 330), the argument—in the mouth of a member of the native elite—is a familiar one; but Tao’s internal conflict—and how she chooses to resolve it—when the cases of Frogmorians come up for sentencing is her own. There is, of course, another risk here: that in the granular detail of individual conversations, in the forensic excavation of revealing everyday conduct, the story—because there is always a story—might fade so far into the background, that it is almost forgotten. Duchamp’s authorial technique of combating this is to provide a smattering of Dune-style interludes in between chapters, which have excerpts from suggestively titled tracts such as “Frogmore’s Destiny: A Manifesto for Independence,” “A Travelers Handbook to the Galaxy,” and “The Trouble with Frogmore,” among others. These tracts contain macro-level observations on Frogmorian life, culture, politics, as well as a historical perspective on the events of the book. Sometimes, this works; sometimes, equally, it doesn’t. For example, “A Manifesto for Independence,” which, presumably, is Frogmore's equivalent of the Declaration of Independence, reads more like a coolly detached encyclopedia. Duchamp also adopts another technique—this time, on the lines of Margaret Atwood’s The Handmaid’s Tale. The Foreword of the novel is written by an individual from “Frogmore Central University,” who explains that she is writing five hundred years after the events of the novel, and that what follows is her reconstruction of those events. That there still exists a Frogmore Central University five hundred years after the conflict, with a historian who is in a position to write about it, suggests that whichever way it ended, the “independence movement” was at least partially successful. For some readers, this—coming right at the beginning of The Waterdancer’s World—might spoil the note of irresolution with which the novel ends; keeping in line with the novel’s focus on micro-narratives, we are not told how the conflict finally panned out. But if there’s someone from Frogmore Central University writing about it five hundred years hence, at least some outcomes are positively ruled out. The Waterdancer’s World is a highly ambitious novel. For the most part, it is able to do justice to this ambition. Nonetheless, there are occasions where one feels that the complexity is too much even for the writer to handle. A breed of Frogmorian animal of great cultural significance called “the time tripper” puts in an appearance at the beginning of the novel, suggests that it will have a major part to play, but then disappears and is not heard from again. Off-worlders never bare their faces, but instead put on “mood-faces” (which appear to be masks that relay moods), but not only is it never explained what precisely this phenomenon is, we are not told how and why it emerged in the first place. And then, on occasion, the unfolding of the narrative is simply too slow: the punishment of “Total Rehabilitative Therapy” is referred to often, but what precisely it entails is revealed only towards the end of the novel, by which time a reader’s curiosity might have peaked, and then receded. These are, however, minor quibbles: it would be churlish to expect a novel as spectacularly ambitious as The Waterdancer’s World to succeed on all counts. Nor, in this short space, can a reviewer do justice to many of the other interesting features of the book, such as the University Planet of Pleth, the role of Solstice’s companion, Sadora Lumi in creating the dance, and a segment of the novel written in epistolary form. The Waterdancer’s World provokes and fascinates in equal measure, and is probably the kind of novel that one can return to, and find new things in, with each successive reading.